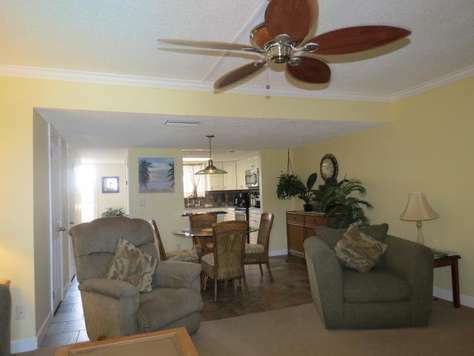 This corner first floor ocean front condo is the perfect location for your next vacation. Just step out your patio door and enjoy the sunshine and feel the ocean breeze. 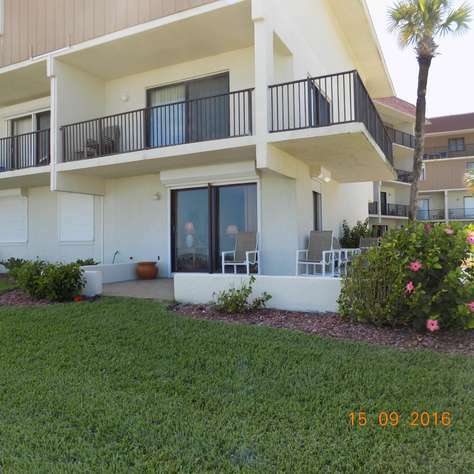 Enjoy beautiful ocean views and sunsets from this unit’s patio. It features two bedrooms and two bathrooms. The bedrooms are equipped with one king size bed and two twin beds to accommodate a family's stay. We supply the bed linens and towels. The newly upgraded kitchen has all the comforts of home with the brand new stainless steel appliances and granite countertops. The kitchen is fully equipped with utensils and dishes. Internet service provided in unit. Relax in the Solar Heated Pool . For your convenience we have a Coin Operated Laundry in Common Area. There are no streets to cross, no cars on the beach! Internet available in unit. 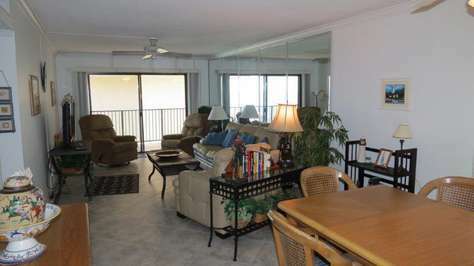 First floor, Oceanview condo, spacious 2 bedroom, 2 bath first floor. Courtyard style, no streets to cross, no cars on the beach! Park directly behind the unit! Master BR includes one king bed with private bath. Second bedroom has two full size beds. Bed Linens are provided and towels provided. 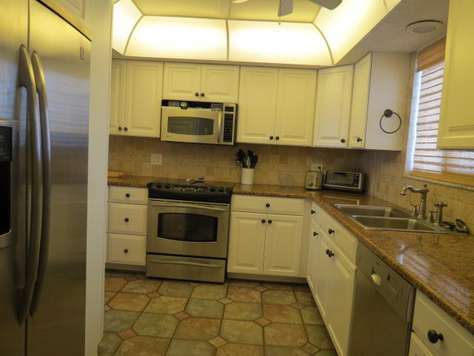 Newly renovated custom kitchen with granite tops and new appliances. Beautiful ocean and sunrise views from this unit's patio. Perfect choice for a romantic weekend or a family vacation. Your vacation awaits you! Internet available in unit. This unit is equipped with internet. 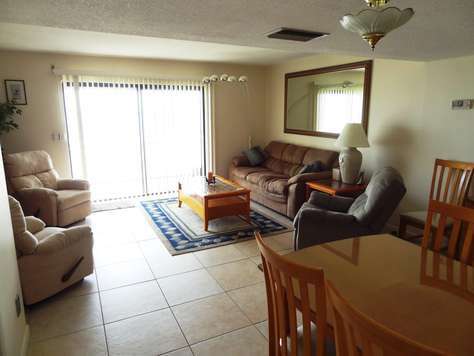 Beautiful, relaxing first floor with an ocean view, 2 bedrooms, 2 baths. You won't beat the convenience of this unit. Park directly outside the entrance door. Watch the sun rise over the ocean from the patio. Step off the patio into the courtyard with resort-style pool, then walk straight onto the quiet, no drive beach. Kitchen is newly upgraded, complete with dishes, utensils and cookware. The guest bedroom has two double beds and a private bath. Second bedroom has a queen bed and separate bath with tiled, walk-in shower. Linens provided. Wifi available. 2 bedroom 2 bath unit. 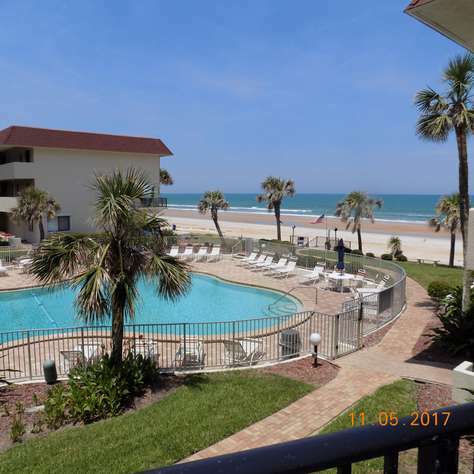 Enter Unit 201 on the second floor of the Bent Palm complex and walk into the newly updated updated living area featuring wood floors, fresh colors, new window coverings, and comfortable leather furniture. A corner entertainment center has a 42 inch flat screen TV, DVD player, a modem providing high speed internet access and WIFI. Step out your patio door and enjoy spectacular ocean views and sunrises from the wrap-around balcony. The main living area also includes a fully equipped kitchen with microwave, dishwasher, glass top stove, refrigerator, new Kuerig coffee maker and plenty of utensils and dishes. For your convenience there is also a half bath on the main living level. The newly carpeted upstairs includes 2 bedrooms and 2 bathrooms. The master bedroom features a king size bed, built-in vanity, 2 spacious closets, windows with direct ocean views on two sides, and a new flat screen TV. The second bedroom includes one queen and one twin size bed and also has an ocean view. The second bedroom also has a outside exit door. We supply the bed linens and towels. The low-rise Bent Palm property provides a homelike environment with grassy lawns surrounding the fenced solar- heated pool. There are no streets to cross and no cars on the beach! A large coin-operated laundry room is available for our guests, and an elevator provides access to the second and third floors. Step right into paradise in this ocean front condo. 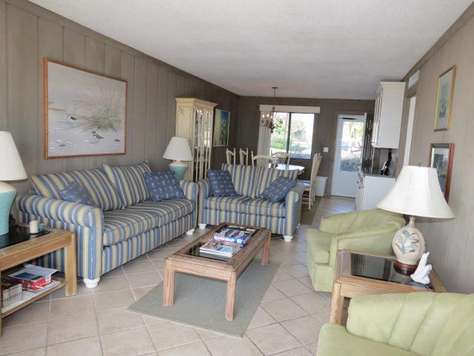 This second floor ocean front condo is the perfect location for your next vacation. 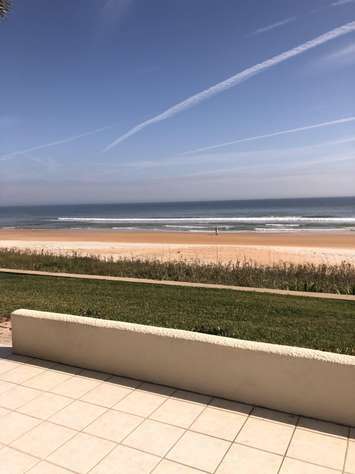 Enjoy the morning sun rises from the unit’s balcony and feel the ocean breeze. 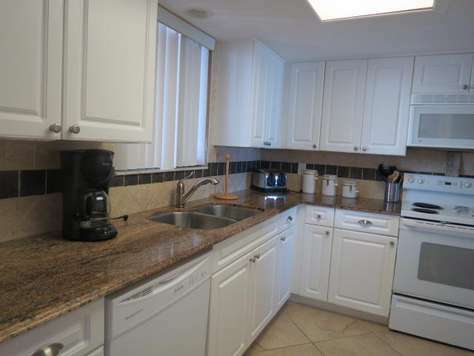 The kitchen and baths have been completely remodeled with granite countertops. The kitchen is fully equipped with utensils and dishes. 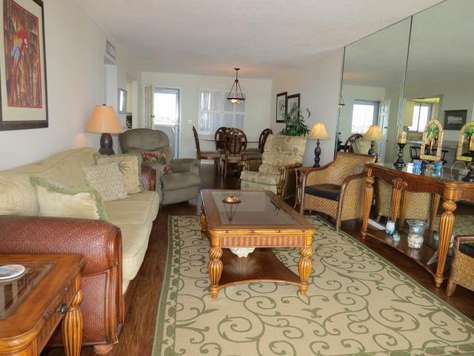 This condo is tastefully decorated throughout with traditional style furniture ready for you to move into. It features two bedrooms and two and one half bathrooms. The bedrooms are equipped with one king size bed, and two double beds to accommodate a family's stay. 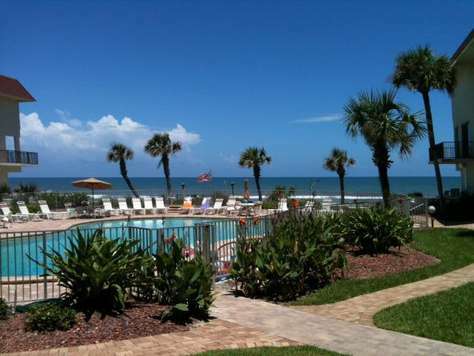 Relax in the Solar Heated Pool or walk to the ocean only steps away. 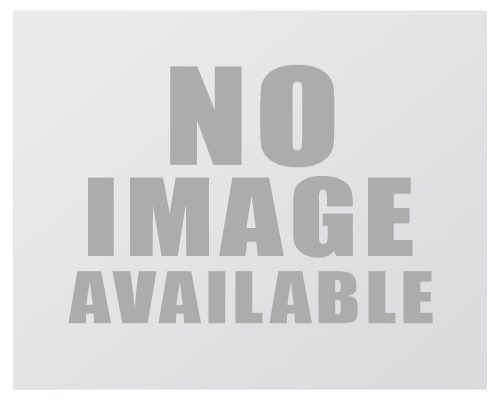 Centrally located, just minutes to the grocery store or shopping. It’s almost like having your own private beach, no streets to cross or traffic to contend with. This unit is equipped with wireless internet. 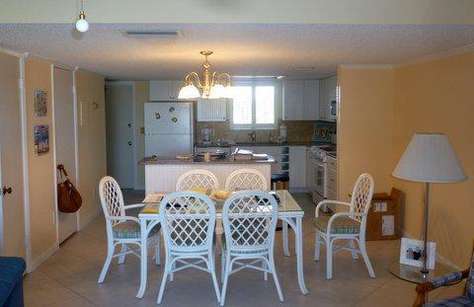 Gorgeous 2 bedroom, 2 and 1/2 bath townhouse condominium located on no drive area of Ormond Beach. Features an open kitchen floor plan with upgraded cabinets and working island, stocked with dishes and utensils. The combination living and dining room is perfect for family gatherings. Bedrooms come equipped with linens to accommodate one king and two double beds. Bathrooms are equipped with an adequate supply of towels. 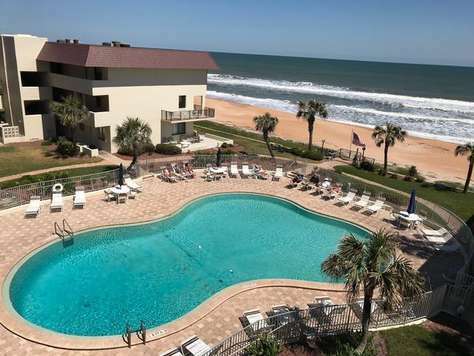 Spectacular Oceanview 2 bedroom, 2 and 1/2 bath townhouse condominium located on no drive area of Ormond Beach. 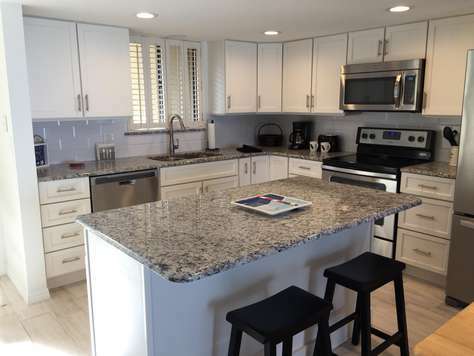 Attractively decorated throughout, featuring a newly upgraded kitchen with granite countertops and working island for additional workspace, plus cabinets stocked with dishes and utensils. The combination living and dining room is perfect for family gatherings. Bedrooms come equipped with linens to accommodate one king and two double beds. Bathrooms were recently remodeled and come equipped with an adequate supply of towels. 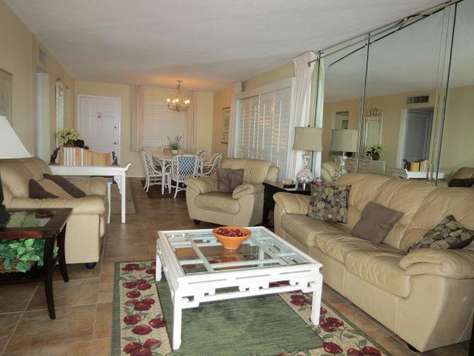 This fourth floor 2 bedroom two bath condo overlooks the entire complex and beach. The wraparound patio has a tiki bar and ping pong table for outdoor fun. Private laundry room with brand new washer and dryer available off balcony. Magnificent views of the ocean high above it all. The inside features newly upgraded working kitchen with white cabinetry stocked with dishes, utensils, and cookware. Spacious living room including a 50 inch brand new Smart TV. The beach themed décor with bright colors pleasing to the eye, surf board accents and more. Combination living and dining room perfect for family gatherings. The two bedrooms have one king and 2 doubles. Bed linens and towels supplied. Internet available in unit. This unit is equipped with wireless internet. 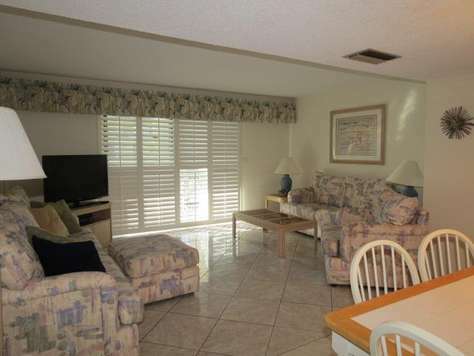 Relax and enjoy your vacation in this beautiful decorated two bedroom, 2bath condo. This unit is located on our fourth floor featuring a newly upgraded working kitchen stocked with dishes, utensils and cookware leads. Combination living and dining room tastefully decorated with Mediterranean style furniture accented by a mirrored wall and oak hardwood flooring. 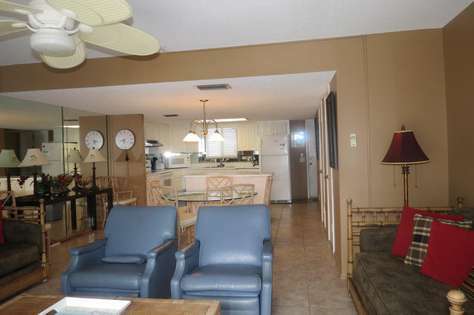 Features two bedrooms and two bathrooms equipped with one king size bed and two double beds. Bed linens and towels provide. 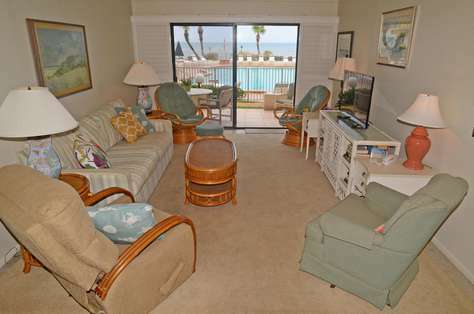 Sit out on the patio to enjoy the views of the pool and ocean. This unit is equipped with wireless internet.